NID Entrance Exam 2019 – The result for NID DAT Prelims 2019 for BDes has been announced on March 20, 2019. The result for NID entrance exam 2019 for B.Des programme is made available online at admissions.nid.edu. The result for DAT Prelims for M.Des programme was announced on February 20, 2019. The NID 2019 entrance examination is conducted in two parts. First, the prelims examination that was held on January 06, 2019, and then the Main examination, which is going to be conducted on May 12 or 19, 2019 for BDes & GDPD, and on April 12-13, 2019 for MDes programme. 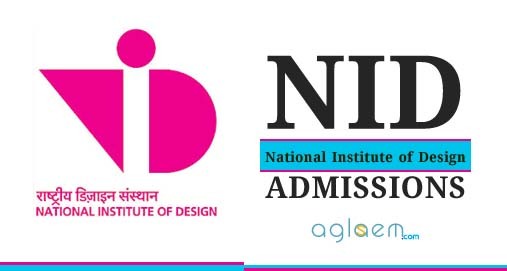 NID 2019 is a national level entrance exam which is being conducted by the National Institute of Design. 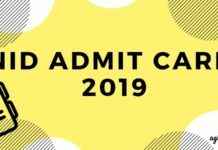 Get here NID Entrance Exam 2019 complete details such as application form, edit form, admit card, syllabus, exam pattern, answer key, result. Latest: NID DAT Mains 2019 Exam center selection for B.Des and GDPD is available until April 09, 2019, use the link provided below to select the center. 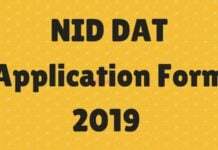 All important dates for NID Entrance Exam 2019, NID Admission 2019, NID DAT 2019 is available here. Make sure to apply online, download admit card, check answer key, check result as per official schedule only. Click here to check the NID 2019-20 revised scheduled only at Bengaluru Campus. Click here to check the schedule for M.Des. DAT Mains Exam 2019. NID Ahmedabad and its Bengaluru, Gandhinagar campuses are Institute of National Importance and also autonomous institute under Department of Industrial Policy and Promotion. It is also a member institute of Association of Indian Universities. They offer full time Bachelor of Design (BDes) and Master of Design (MDes) programmes. NID Vijaywada and NID Kurukshetra are independent autonomous institutes under DIPP. They offer full time Graduate Diploma Programmes in Design (GDPD). 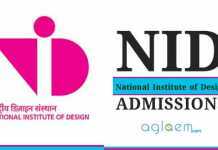 Admission to BDes, MDes, GDPD are through Design Aptitude Test held by NID. Candidates who have filled the application form for NID DAT B.Des and GDPD admissions needs to select their preference for the examination center they will be appearing in. Candidates need to Login and select the desired exam center before April 09, 2019. Login is to be done through the registered E-mail address and the Date of birth of the candidate. 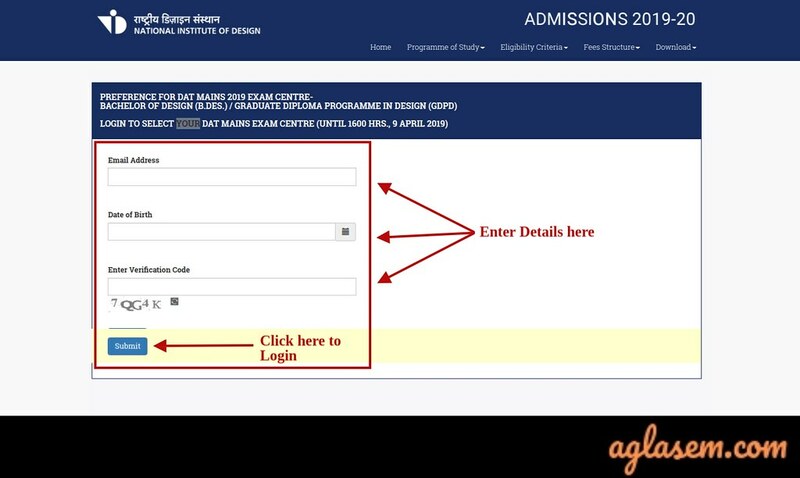 Once the login is done exam center can be selected. We have provided here a direct link to select the preferred exam center. Exam Center: Click here to login and select the Exam centers for B.Des and GDPD. National Institute of Design (NID) has released the answer key of NID DAT Prelims Exam 2019 for B.Des./GDPD available until 1600 hrs. February 20, 2019. Candidates can check the answer key from the official website OR through the link provided below. To check the answer key, you have to log in by providing the Email Address & Date of Birth. Click here to check the Updated answer key for B.Des/GDPD DAT Prelims Exam 2019. The admit card is a very important document. The candidates must carry it to the exam hall, else, they will not be allowed to appear for the examination. Along with the admit card, the candidates will also have to carry a Photo ID card. A valid ID card can be a PAN Card, Driving license, Voter ID, Passport, Employee ID Card, Aadhaar Card, and College ID. The candidates should keep their admit card ready even after the examination, as it will be required during the final admission. This information is common for BDes, MDes, GDPD aspirants. DAT prelims evaluates you on Knowledge, Analysis, Visualisation, Comprehension, Creativity. Part I 70 points MCQs with one or more than one correct answer. Test Centres for DAT Prelims 2019 are Ahemdabad, Bengaluru, Bhopal, Bhubaneswar, Chandigarh, Chennai, Dehradun, Guwahati, Hyderabad, Jaipur, Jammu, Kolkata, Kurukshetra, Lucknow, Mumbai, Nagpur, New Delhi, Patna, Panjim, Raipur, Ranchi, Thiruvananthapuram, Vijaywada. Ahmedabad – Animation and Film Design, Ceramic and Glass Design, Film and Video Communication, Furniture and Interior Design, Graphic Design, Product Design, Textile Design. Bengaluru – Design for Retail Experience, Digital Game Design, Information Design, Interaction Design, Universal Design. Gandhinagar – Apparel Design, Lifestyle Accessory Design, New Media Design, Photography Design, Strategic Design Management, Toy and Game Design, Transportation and Automobile Design. For final NID Entrance Exam 2019 Result, marks of DAT prelims will contribute 30% and mains will contribute 70%. Based on the scores obtained in DAT, separate merit lists shall be prepared for each category (General, OBC-NCL, SC, ST & PH). Shortlisted candidates will be called for the Studio Test and Personal Interviews. Based on the Merit list of DAT Prelims, eligible candidates will have to appear for DAT Mains. The number of candidates shortlisted will be no less than three times the number of seats available per category in that discipline or programme (please refer to Section 3 of this handbook to see the total number of seats available). If the total scores of two or more candidates in the DAT Prelims are the same, they will be assigned the same rank. Education: Passed or will appear class 12th exam in any stream from CBSE / IB / ICSE / equivalent board. Upper Age Limit as on 30 Jun 2019: General category – 20 years, OBC NCL, SC, ST – 23 years, PwD – 25 years. Education: Any one out of the following degrees namely Bachelor degree of minimum 4-year duration in any stream after 10+2 OR Bachelors degree of minimum 3 years duration in any specialization under 10+2 OR Full-time Diploma of minimum 4 years in Design / Fine Arts / Applied Arts / Architecture after 10+2. Upper age limit as on 30 Jun 2019: General category – 30 years, OBC-NCL, SC, ST – 33 years, PwD – 35 years. The application form for NID 2019 admission was released on the official website admissions.nid.edu. Candidates had to submit their personal details, educational qualification, and other things in form. Rs. 2000 for General and OBC-NCL Category Candidates. Rs. 1000 for SC/ST/PWD Candidates. Rs. 3000 for Overseas Candidates. Candidates got a window to review and correct details in application form between 23 – 26 Nov 2018. If a candidate is found to be ineligible after modifying information then NID does not refund fees. Candidates must ensure that they update correct details during the application process. To know more about NID 2019 admissions, Download 2019 information brochures is given below.